How is the 1744 woodcut print/image related to the anecdotal "report" of another pig roast to hide gold during the 1860's. It seems to me that perhaps roasting a pig over a spit was a practice that has stood the test of time. It also seems to me, that there are so many Southern myths about hidden gold during the Civil War it seems comical. However, The "gold" at the time was the cash crop cotton-- now it is something more aromatic. 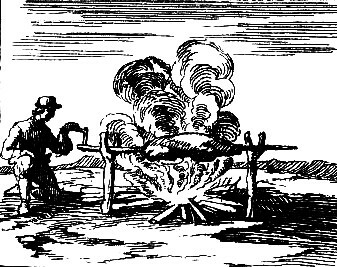 I added the image not because it had anything specifically to do with the Ocracoke Civil War story, but just because I wanted to include an image of roasting on a spit. But now I'm as curious as a journalist about this gold... who, what when, where and how? clever and resourceful? Hardly, read upon it. this was a old trick used in earlier times. sometimes it worked, sometimes it didn't...this doesn't make them any more clever and resourceful than people in miami, or ny or charlotte...it's just a blog story, entertaining though because i haven't heard it in a long time. but like the comment above said - it's your blog.